Welcome to the game page! Here you can play all sorts of games based on my books. (Requires Adobe Acrobat to open. Here's a crossword puzzle to help you learn the colors. Think you know your animales? Why don't you try solving these riddles. Why don't you try a fun word search and a challenging crossword puzzle based on "Eight Animals Bake a Cake"? 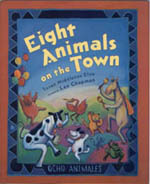 We also have this exciting crossword puzzle and entertaining word search based on "Eight Animals on the Town". Try them both!